Walk around downtown New York on a Sunday morning at between 8 and 10 a.m., and you will find a city still asleep. Something strange happens shortly afterwards. At 11 a.m. the café’s and restaurants open. And then, like a sudden wave of change, everyone you see emerging onto the streets walks around with a venti-sized coffee in hand. They are en-route to their Sunday morning rendezvous. Brunch in NY is a quasi-religious experience, a chance to catch up, and ‘hang out,’ and chat away with one’s closest friends. Heaping platefuls of eggs benedict and custom crafted breakfast cocktails; basketfuls of croissants and muffins; decadently indulgent burgers with pasture-fed beef, limited edition farmstead cheese and small batch pickles: these are the objects of the ritual. And they are all truly very good. No, this is not a food blog, and it will not become one. But this past weekend I was en-route to a favorite SOHO spot for a six-dollar cappuccino — a very good one at that, but not as good as the one 1.5 euro one I get on Via della Croce in Rome, and definitely marked up way beyond current euro to dollar conversions — and I noted the obvious: New York has a specific Sunday breakfast ritual. Coffee first, a necessary jolt of wake-up energy, followed by the brunch indulgences above described; caffeine before the alcohol, and their combined effect evens out. Amidst the bustle of a waking city, the experience of brunch — that is, breakfast at lunch — is a routine so ingrained in our culture, it amounts to a religious observance. they saw a charcoal fire with fish on it and bread. full of one hundred fifty-three large fish. Even though there were so many, the net was not torn. because they realized it was the Lord. and in like manner the fish. Imagine that! The Risen Lord hosting breakfast for his friends! It begs the question as to why this detail is in the theologically rich gospel of John. It would be safe to assume that it is not recounted simply because the apostles had a particularly good time that morning with Jesus on the Sea of Tiberias. There certainly were no ‘must-eat brunch’ lists then, nor was the Sea of Tiberias a trendy hangout like the Highline along the Hudson River in New York. 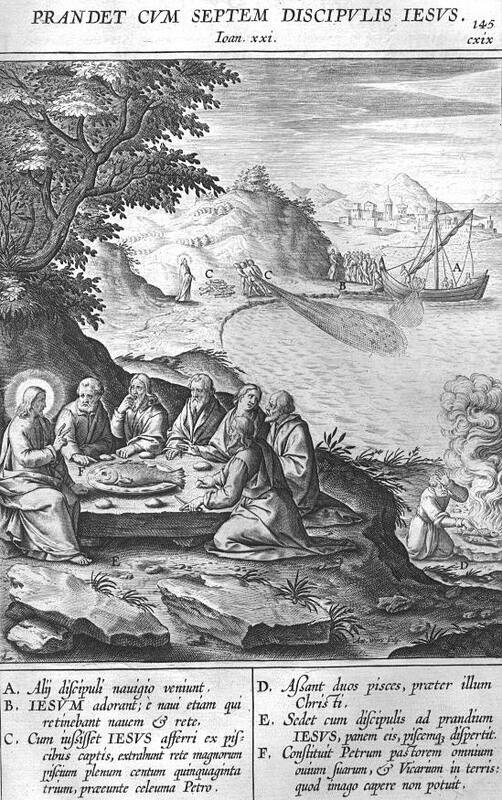 The image of the Risen Christ starting a fire on a stretch of shoreline sand, broiling fish and warming bread for the disciples who had just miraculously caught a very specific 153 fish and dragged the bursting nets ashore, forces us to think of the relevance of that breakfast, and of each breakfast we partake in. The long and short of it is that, in their encounter with the Risen Christ, they were being given a foretaste of paradise. He invited them, to the banquet, again. Over breakfast they recognized Him, risen among them. Could it not be that even now we hear those words spoken personally to us? Come, and taste the food that gives life! Come, indulge in the mystery of my risen presence among you. Come! See! I am the One who said ‘I am the way, the truth, the life,’ and I live! Eat your fill, you who are exhausted from the night watch. I make all things abundant and new! I care for your hunger and your thirst, your weary selves. Come to me, as I live among you. That six-dollar cappuccino takes on a radically new significance, as does each invitation we have ever received to dine with a friend, and every laden table at brunch hour on Sunday. No longer can we look upon those lines for the trendiest brunch spots as simply lines. If among them is even one soul who truly hungers for the food of angels, then that olden Easter invitation to ‘come and have breakfast’ takes on a higher meaning. Breakfast becomes very relevant in the life of the soul, as does every other ordinary act we perform each day. For He infuses all things with risen glory. All things are made new. The Incarnation continues. Paradise has come to earth. And even breakfast, becomes a portal to paradise.